On another note, does a 10.40am LHR-DUB departure provide breakfast or something else? Have a look at post 1, this shows the service patterns. As KARFA says, the full answer is in post 1 with links to photos. However, it will be ‘brunch’ not breakfast. This is likely to be quiche or charcuterie or smoked salmon all of which are served with fruit, yoghurt and bakery basket pass. Chicken Salad which seemed more plentiful than last time, with sun dried tomatoes. Incidentally good and interesting range of wines in the BA Lounge at NCL at the moment. 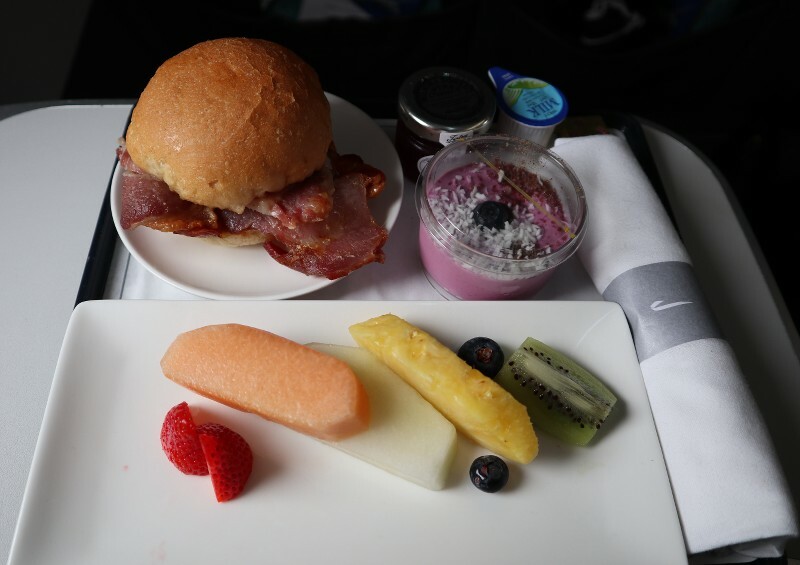 Same meal on the FRA-LHR afternoon flight last week. No menus. Just to be clear, Express and Bands 1&2 do not have a printed menu. Bands 3&4 do. I was very surprised yesterday on BA1337 NCL - LHR evening flighty to find a breakfast menu in the seat pocket from a previous flight. Got my hopes up momentarily. The vegetarian option. The aircraft is a nightstopper so catered at LHR the day before - hence the smaller than usual tray. good question. Looking at some of the other breakfast photos think it might be (?) but not by a great deal if so. I have also TXL-LHR at 14.25 - is that lunch? LBA (like MAN) is an express band route so you get either a hot ham and cheese croissant or a bacon roll - it rotates between the two. Have a look at the wiki as there should be a few photos. 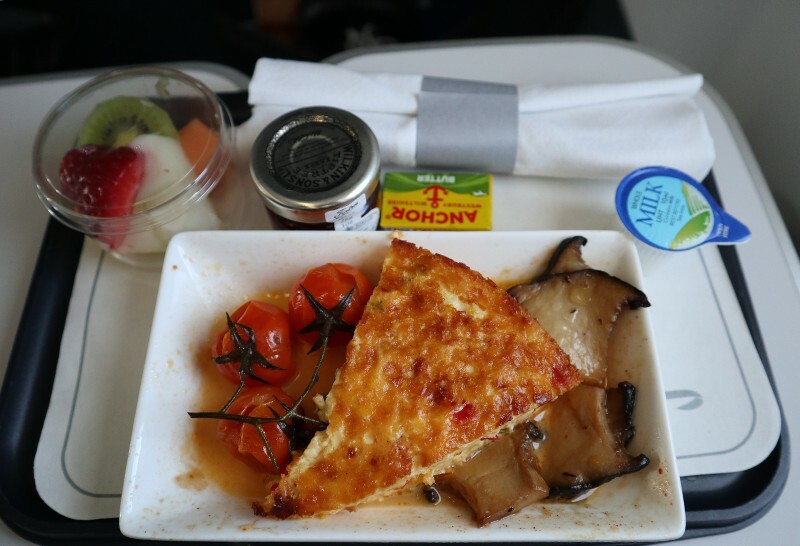 MUC will be a choice of hot English breakfast or hot vegetation breakfast - usually a omelette or frittata of some kind. 1425 to TXL is a band 1 afternoon tea. There should be some photos in the wiki to show you what you get. There is something a bit strange about that fluorescent yellow sauce isn't there ? When you take a picture, it changes colour. Spooky. It is. And quite frankly, as much as I like curried dishes, I personally think that this one doesn't work at all for me. I much prefer the other version of the roast beef with the horseradish cream. The alternative (the tomato and mozzarella) is also one of the poorer vegetarian dishes in my view though in fairness, I always hear a lot of people ordering it, more so than other vegetarian stuff, so I guess it is popular at least on paper (or lack thereof). It is. And quite frankly, as much as I like curried dishes, I personally think that this one doesn't work at all for me. Yep, it doesn’t go with the beef at all, and there’s way too much of it. Did a Stockholm turnaround BA778 (10.35) to BA779 (15.10) on Thursday the 28th, no menus either way surprisingly. Rather curt CSM only offered two choices on the outbound as well. The ‘pork’ turned out to be the Wiltshire pork from an above post. Another surprise was a new set of crew on the return flight who were much better in service and topping up drinks as well. Was Emerald on the way out and GCH back in, equally ignored/not acknowledged. The other option this rotates with on the express breakfast is the warm ham and cheese croissant. This is much better though. adrianlondon, smokie36 and george77300 like this.